Private student loans comprise only a small fraction of the $1.31 trillion student loan market, but borrowers who have these loans still have a bone to pick with their servicers. Borrowers with private loans griped about dealing with their servicer or lender more than any other student loan complaint that the Consumer Financial Protection Bureau received in 2015, according to a new analysis by NerdWallet. The CFPB first set up a system to take complaints about private student loans in 2011 and has seen steady growth in the use of the service since then. NerdWallet looked at the more than 5,000 private loan complaints filed last year with the bureau and made publicly available on its Consumer Complaint Database. The CFPB is the federal watchdog for consumer financial products and services. Difficulty dealing with a lender or servicer was the most common student loan gripe made to the CFPB about private loans during 2015, with a total of 2,779 complaints. Lenders and servicers are not always one and the same. A lender owns and issues the money you borrow, whereas a servicer is paid by a lender to manage loan payments. One-third of grievances made under this category related to “trouble with how payments are handled.” One in every five complaints indicated that the borrower received “bad information” about a loan. Other findings within this category: 17% reported customer service trouble; 14% took issue with fees charged; 10% were bothered by multiple phone calls about a loan; and 9% needed more information about a loan balance or terms of the loan. The second most common complaint overall involved inability to repay a loan, with a total of 1,580 grievances lodged by consumers. Of those borrowers, 43% said they were unable to get flexible payment options, while 40% said they couldn’t decrease monthly payments. The other 17% said they were unable to temporarily postpone payments. An inability to pay loans can quickly lead to default, especially in the private student loan market, where default can occur 90 days after a missed payment. A borrower in default could be subject to a court-ordered judgment, which can lead to wage garnishment. The number of complaints made in 2015 was minimal within the $99.7 billion private student loan market, according to MeasureOne, which measures data on private student loans. However, the CFPB can track only what is reported to it. Some complaints may be landing at the state level or with other federal entities. And complaints made to the CFPB are not always valid — borrowers may have a grievance with the terms of their loans or experience an inability to pay, which doesn’t necessarily put the servicer at fault. The overall low volume of complaints may be due in part to lack of awareness that there’s a place to complain. The bureau began accepting consumer complaints on a variety of financial services — including student loans, mortgages and credit reporting — in July 2011. The number of users lodging complaints has grown as knowledge of the system’s existence has spread, and the database now holds more than half a million complaints. 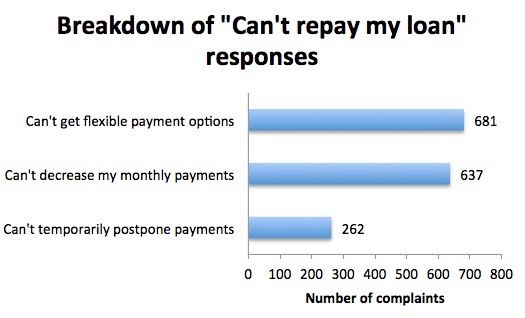 Of the complaints lodged, 97% received timely responses from the companies involved, according to the CFPB. Grievances are made publicly available for search and viewing, which adds pressure to the companies to find resolutions. It’s worth noting, however, that a company sending a response to a consumer doesn’t necessarily mean the issue was resolved to the consumer’s satisfaction. Unlike some other consumer financial markets, there are no federal rules or standards across the private student loan marketplace beyond general protections against deception and abuse, says Seth Frotman, CFPB student loan ombudsman. The bureau can help when customers’ efforts to resolve disputes with servicers fail. And in August 2015, student loan servicer Navient Corp. announced it had received notification from the CFPB’s Office of Enforcement that the bureau was considering a suit against subsidiary Navient Solutions Inc. related to an investigation into disclosures and assessments of late fees. The notification from the CFPB gave Navient the opportunity to present its own information to the CFPB before any enforcement occurred. Navient provided a response to the CFPB’s letter in September, stating the company was cooperating with inquiries and is “committed to resolving any potential concerns,” according to its latest filing with the U.S. Securities and Exchange Commission. In an effort to pursue reforms of the student loan servicing marketplace, the CFPB announced in September that it was working with the U.S. Department of the Treasury and Department of Education to push for the creation of industrywide quality service standards, regulations that hold servicers accountable for breaking the law, accurate and actionable information about borrower repayment options, and greater transparency that includes public loan performance data on the servicer level. The private student loan market is estimated to comprise roughly 7.6% of the $1.31 trillion student loan market, according to MeasureOne. Commercial banks hold 40% of private student loans and around 20% of federal student loans, according to the Federal Reserve. Six companies — Citizens Bank, Discover, Navient, PNC Bank, Sallie Mae and Wells Fargo — represent 66.7% of the private student loan market, according to MeasureOne. The companies that saw the highest number of CFPB complaints also serve the most consumers (the CFPB does not track the proportions of company service coverage to complaints made). Here’s how some of the largest companies in the market approach complaints. Navient, the largest loan servicer in the U.S., tops the list of private companies that received the most complaints lodged with the CFPB in 2015, with a total of 1,800. Navient’s Office of the Consumer Advocate is the first point of contact for complaints made to the company and responds to comments submitted from the CFPB complaint portal. Nikki Lavoie, a spokeswoman for Navient, says each concern is responded to within the time frame set by the CFPB. The number of complaints lodged against Navient through the CFPB represents a fraction of 1% of Navient’s customers, Lavoie says. The company was handling $26.4 billion in private education loans as of Dec. 31, 2015, she says. “The overwhelming majority of borrowers have a manageable amount of debt and are successfully paying it,” she says. Navient suggests that student loan borrowers who are struggling to make payments reach out directly to their servicer to seek alternative repayment options. For instance, as of the end of 2015, $2.5 billion — or 9.5% — of Navient’s private education loans were enrolled in the company’s interest rate reduction program. Navient says customers who use this program have more affordable monthly payments that still pay down the principal. There were 261 complaints made to the CFPB against Sallie Mae in 2015. The previous year, Sallie Mae split into two companies: Navient and Sallie Mae. Navient took over the old Sallie Mae’s existing private student loan portfolio as well as its federal student loan contract with the U.S. Department of Education. The new Sallie Mae, which operates as a lender and a servicer, now provides private student loans to 1 million customers and co-signers. After the split, Sallie Mae invested millions of dollars to enhance its overall customer experience, according to company spokesman Richard Castellano. He adds that 98% of Sallie Mae’s customers pay their loans on time and less than 2% are in default annually. American Education Services, the commercial servicing division of the Pennsylvania Higher Education Assistance Agency, was the subject of 500 CFPB complaints from borrowers in 2015. The company serves 2.4 million borrowers with loans totaling $49.2 billion. Of those complaints made to the CFPB, 92% are unsubstantiated, according to Keith New, public and media relations director for PHEAA. In the vast majority of cases, he says, borrowers have exhausted all eligibility for debt relief. With all complaints, New says, PHEAA is limited by the terms of the borrower’s contract with the lender and the company has to coordinate closely with the loan originator to take any action. In 2015, 278 complaints were made to the CFPB against Wells Fargo. The company serves 1.1 million private student loan customers with a total of $12.2 billion in loans, says Jason Vasquez, a spokesman for Wells Fargo. More than 98% of private student loan customers with Wells Fargo are current with their payments, according to Wells Fargo’s Quarterly Supplemental. The company’s private student loan modification program can help borrowers who are having trouble paying off their loans, Vasquez says. “If there is a customer who is behind on their payments, we proactively reach out to those customers to see how we can help them to understand what their current financial loan situation is and see if the program can assist them in helping to lower their payments and make it more affordable,” Vasquez says. The more loans you have, the more likely it is you’ll have more than one loan servicer to deal with. Consider refinancing student loans into a single new loan that will be handled by one servicer to lessen the chances you’ll have to make a complaint. When paying for college make sure to maximize your federal student loans first before considering private loans. If you do need to borrow from a private lender compare all possible options to determine which works best for you. Refinancing is beneficial if you get a lower interest rate. You could also opt to refinance by extending the length of the loan term. This would lower your monthly payment but increase the total you’ll pay in interest over time. If you have federal loans, you don’t choose your loan servicer; it’s assigned by the Department of Education. If you refinance your federal loans into a single private loan, you can choose your lender and, thus, your servicer as well. Refinancing is best for those with job security, steady income, a good credit score, mainly private loans and a positive payment history of at least two years. Even if you qualify, refinancing isn’t always best. Refinancing federal loans means losing benefits such as public service loan forgiveness, income-driven repayment or interest-free deferment on subsidized federal loans for job loss. Research all of your repayment options before you decide to refinance. If you do pursue refinancing, consider carefully which servicer you want to work with. NerdWallet examined data and gathered insights from the Consumer Financial Protection Bureau’s Consumer Complaint Database. We looked only at complaints in 2015 that pertained to private loans. Data on federal student loans was omitted because the CFPB collects complaints on these loan types only in regard to credit reporting and debt collection. The complaint categories are self-selected by consumers, not by the CFPB. Victoria Simons is a data associate at NerdWallet, a personal finance website. Email: vsimons@nerdwallet.com. Anna Helhoski is a staff writer at NerdWallet. Email: anna@nerdwallet.com. Twitter: @AnnaHelhoski.